Basically, any fire safety equipment that would be installed in the building structure in Malaysia requires the approval of the Fire Department of Malaysia (BOMBA). This approval is not the same as certification issued by the standards body such as SIRIM, FM, UL, CE or the like. 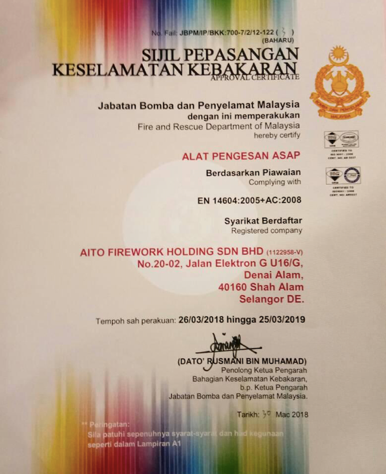 Approval certificate is a certificate issued by the Fire Department of Malaysia (BOMBA) on a product or fire prevention equipment.This certificate is issued by the organization responsible for approving the Fire Certificate for a building of Fire Department of Malaysia (BOMBA) itself. Yes, you may have a problem if you have never installed an approved / certified by them. 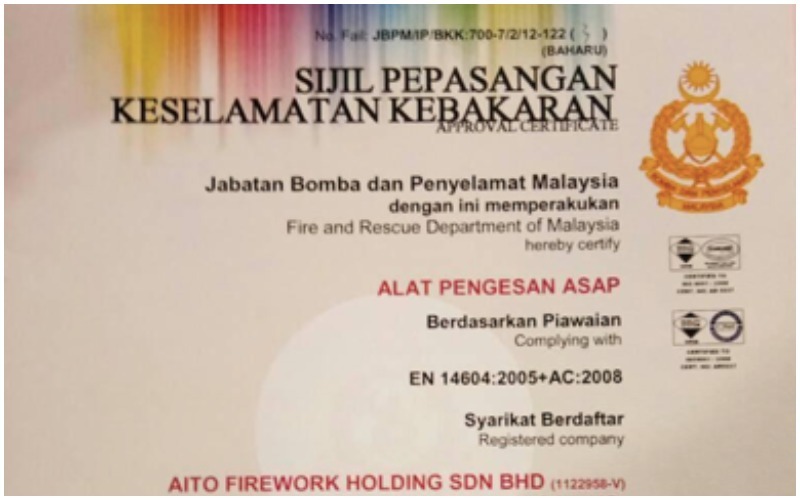 Most manufacturers of products and equipment for fire prevention overlooked that their products will be more valuable if the products and equipment involving fire prevention is recognized and given a certificate of approval by the Fire Department of Malaysia (BOMBA) for use in the Malaysian market. In Malaysia, most goods and products used for the purposes of fire prevention have surpassed the standards set by the standards body such as the Standard and Industrial Research Institute of Malaysia (SIRIM). After that, then the producers of those products may apply in writing for the approval certificate to be issued by the Fire Department of Malaysia (BOMBA). However, not all products and fire safety equipment brought into the Malaysian market requires approval from SIRIM standards to obtain a certificate of approval from the Fire Department Malaysia. This is because if the products and equipment that have been certified by the standards body such as FM, UL or CE, they are also eligible to apply. But products such as portable fire extinguisher, fire rated door and some other products must be approved by SIRIM. Keep in mind, Approval certificate from the Fire Department of Malaysia (BOMBA) has to be renewed every year. At the same time also the manufacturer of the product must ensure that the certification body standards are still valid and has not expired. 1. The company’s official application letter. 3. A copy of the letter of appointment distributor (if not the manufacturer) – a letter of appointment from outside the country must be certified by the local commissioner of oaths (commissioner for oath). 4. A copy of the latest test report – Any test reports from abroad must be certified by the local commissioner of oaths (commissioner for oath). 5. Company profile (such as organization charts, work flow, etc.). 6. Brochure and supporting documents. 7. Mini sample material / system (with the label company, the name of the material). 8. For applications suppression system (halon alternative), the applicant shall complete the following additional documents. Should you require the services of a consultant in order to get an Approval Certificate from the Fire Department of Malaysia (BOMBA), we’re here to help. You can contact us. We are also suppliers of fire extinguishers in Malaysia and are verified by the Fire Department of Malaysia.